I am a student of history. One of my top strengths is “context” (StrengthsFinder by Gallup–WELL WORTH your time). The most important lesson I gained in college from all of my history courses was this: Context is key–you need to know the hows/whys/whats of how we got to where we are so that you can ask “what now” and act wisely. I am also a church leader. I have been in various leadership roles for the past ten+ years. I have seen churches grow and I’ve seen churches decline. 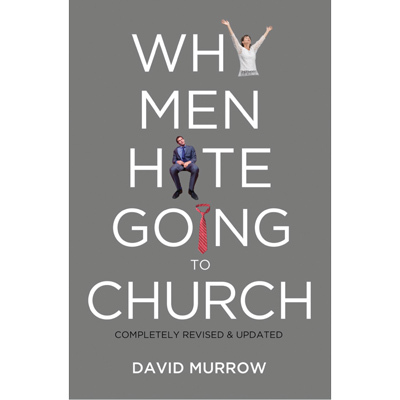 There are many good books that I’ve read on the subject of how church should be done, but I have to say that David Murrow’s book “Why Men Hate Going to Church” has made the top ten list. Mr. Murrow begins by giving a history of church dynamics and specifically looks at the role that men have played over the past few hundred years. It’s hard to argue with his facts: the church has become highly feminized, and it’s a cycle that will keep going until we make church a more “man friendly” environment. His fascinating historical overview truly helps us see why we have such a mess today when it comes to the decline of a male presence in the church. He doesn’t discriminate between denominations–he acknowledges that they’ve all seen a decline and discusses why. But he does far more than just offer a commentary on the problem: he offers solutions based on research. One example: he points out several phrases and terms that are NEVER found in the Bible, but we use them all the time to describe what it means to be a Christian. We’ve made it this almost romantic-sounding relationship (i.e. using words like intimate, personal relationship, etc. ), when in reality the Gospel is a mission. We are God’s ambassadors, His agents in this world, and we are called to action. We are here for a purpose. Those are the types of things that get men fired up–not mushy worship/talk. Yet, because the churches are typically filled with more women than men, the messages have conformed to the gender-gap, and this isolates men even further. For church-planters and pastors especially, chapter 13 alone is worth buying the whole book. As I read this chapter (as with many others), I was struck by the truth of his words in terms of how our Kingdom focus has changed so much with the feminine influence in the church. We’ve become far more focused on making church a “family” than a mission-control for the Kingdom work to which we are called. As such, pastors spend so much time dealing with internal conflicts rather than reaching out to our communities who are in need of the Word. I know that many of my friends who are feminists will likely disagree with much of what this book says…but I have to agree. Changes need to be made, and we need to follow the biblical example that Jesus gave us during His earthly ministry. He reached out to 12 MEN primarily, because He knew that those men would become leaders that both men and women would follow. We need strong male leadership once again in our churches, and this book offers many suggestions that will change the course of your church forever. Haha…I’m totally one of your feminist friends and probably would never pick up this book, but maybe…maybe…I will someday now. But I do have one question: he says because we focus more on the “familiness” of the church pastors now have to deal with infighting and stuff. But isn’t infighting and discord within the body what most of Paul’s letters were about? I don’t think that specific issue is generational.